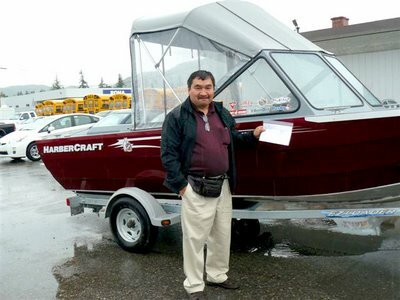 Kinsmen Club of Terrace: 2009 Riverboat Raffle - Grand Prize Winner!! 2009 Riverboat Raffle - Grand Prize Winner!! Philip Azak from New Aiyansh! 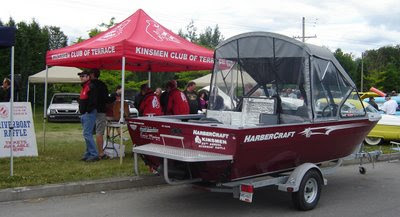 The Kinsmen would like to thank Ken's Marine for providing us with another spectacular boat. We had nothing but rave reviews about it throughout the entire raffle. Again, a huge thank you to all our sponsors and ticket locations. 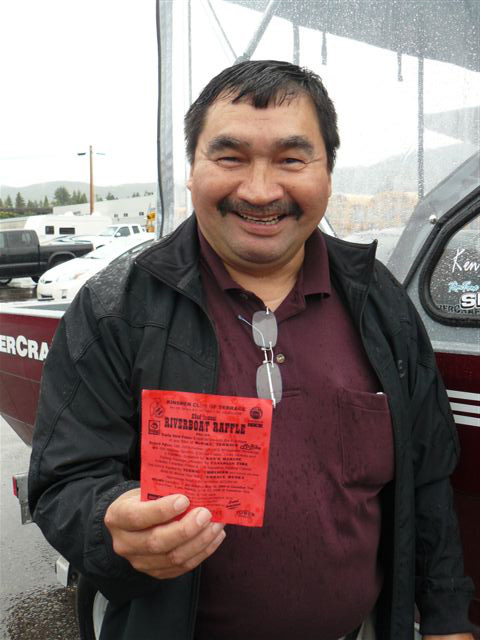 Misty River Tackle, Fish Tales, Tempo Gas Bar, Northcoast Anglers, Terrace Husky, NSCU and Terrace Chrysler and Toyota. Big thanks to CFNR for going above and beyond to promote our raffle. 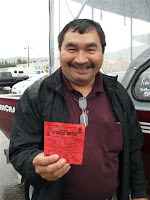 Also on our list of thank you's is Canadian Tire not only for providing their parking lot for us and for putting on a fantastic Car Show giving us a great venue to give our prize away but for providing an $800.00 fishing package for Phillip as well. We tip our hats to Braid Insurance for insuring the trailer so we could move the boat around, to Tower Radio for the marine radio, Sight and Sound for the stereo system no fisherman can be without, Terrace Husky for the $500.00 in Marine fuel and Ron Anderson from the Canadian Power and Sail Squadron for the boating course Phillip's gonna need to pilot this 18 foot beauty. Plus thanks to the Royal Canadian Legion: Terrace Branch for lending us there draw barrel at the last minute. Our 23rd raffle could not have been the success it was without these dedicated business partners. We would also like to thank Bruce @ McBike for providing us with a most excellent early Bird Prize of $1000.00 towards any bike at his store. 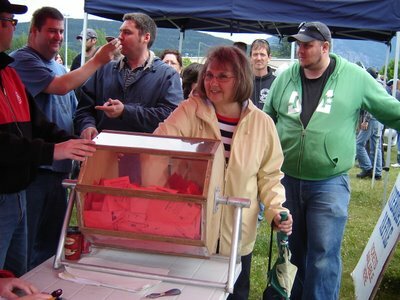 That prize was won by John Vander Ploeg of Terrace on May 10. With the success of this raffle your dedicated Kinsmen are able to continue our work of Serving the Communities Greatest Need. The tireless work of this group of 20-some-odd volunteers will go on thanks to you, our loyal "customers". To those of you who bought one ticket and those that bought many, don't feel sad that you didn't win the boat, feel glad that you contributed to an extremely worthy cause. We cannot do what we do without you and we (and those who benefit from these donations) thank you. 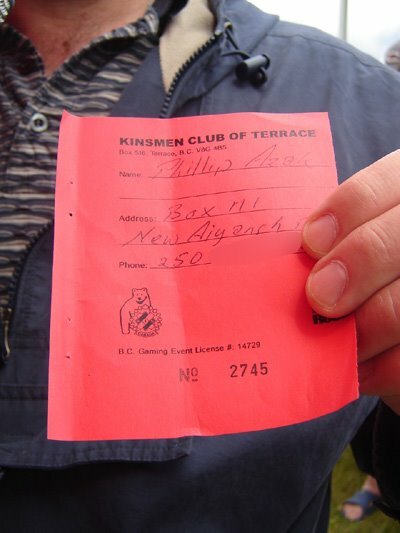 You are all a part of the most prolific Kinsmen Club in this province and that, my friends, is something you can all feel as much pride about as we do. Thank you all and we'll see you in the fall for our 4th Dream Car Raffle, and big round of applause to Byran and Andy for chairing this year's event.